Contains spoilers for the original Trilogy. Sinner follows Cole St. Clair, a pivotal character from the number one New York Times bestselling Shiver Trilogy. Everybody thinks they know Cole's story. Stardom. Addiction. Downfall. Disappearance. But only a few people know Cole's darkest secret, his ability to shift into a wolf. One of these people is Isabel. At one point, they may have even loved each other. But that feels like a lifetime ago. Now Cole is back. Back in the spotlight. Back in the danger zone. Back in Isabel's life. Can this sinner be saved? Former lead singer of Narkotika Cole St. Clair, had been missing for two years when the world had presumed his addiction to the rock star life style had finally caught up with him. He's now moved to Los Angeles to forge a new career, stay clean and prove to Isabel Culpeper that he isn't the same Cole that was left on the floor with the needle in his arm, shifting into his wolf form and begging for death. Isabel has learned to survive by feigning disinterest. Currently studying to become a registered practitioner and working part time in a small boutique where wealthy celebrities demand the latest fashion forward attire. It's a lonely existence, but she never expected Cole to stroll back into her life and further complicate her emotions. Cole claims that Isabel is the inspiration behind the move, but she soon realises that it's a new reality program by Baby North, that can be credited to his return. But Baby North isn't interested in Cole's success, nor staying clean. She's become a household name by recruiting former musicians and celebrities and is intent on manufacturing their demise, the cameras capturing their fall from grace. Cole is adamant that he won't spiral out of control, he's still hurting from the memory of former drummer Victor. But Baby is determined to throw temptation in his path, parties, all too willing to please fans and surrounding him with others that struggle with substance abuse. But as the tentative relationship between Cole and Isabel begins to bloom once again, Isabel's insecurities and lack of trust may only drive them further apart... And for Cole to turn his back on his own resurrection and resume the life of a pack leader once again. I really enjoyed the Wolves of Mercy Falls series, and Sinner is no exception. It follows the story of Cole St. Clair, leader of the pack and owner of the reserve in Minnesota, to which Sam from the original series calls home. But after the incident with Victor and Isabel, in which Cole had begged for death to take him, he's reinvented himself and is now clean. He's signed onto a reality based show, which is said to document his rise to stardom once again, but producer Baby North is known around Los Angeles as a woman who has made her living from destroying the lives of former celebrities trying to claw their way back into the spotlight. But Isabel doesn't trust easily and is struggling to accept Cole's new found lease on life. Despite her internal conflict, she falls into a game of avoiding the cameras, learning to trust again and share Cole with his fans, while navigating the delicate relationship Cole is persistently pursuing. Just one of the many aspects that I found endearing about Cole, was his friendship with driver Leon. Leon is middle aged and unhappy in general with his life, and Cole is determined to help Leon make the most of being a tourist in his own city. Well loved characters such as Sam and Grace from the original series make brief appearances, but the reader is reintroduced to former Narkotika Bassist Jeremy, who is now happy and living in the suburbs of Los Angeles. 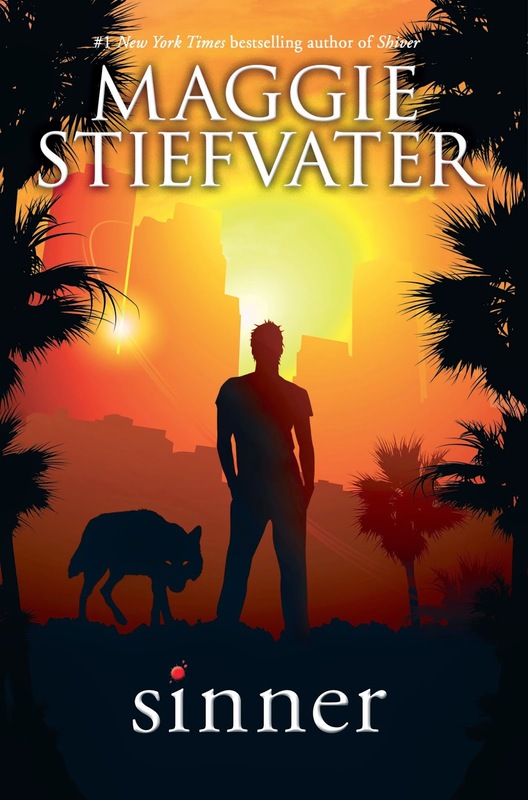 Maggie Stiefvater has an edgy and contemporary style of writing, weaving paranormal elements throughout the storyline. She creates strong, sassy and sarcastic characters that readers can endear themselves to. Sinner is engaging, flirtatious and a brilliant read for not only fans of the Wolves of Mercy Falls series, but can also be read as a standalone. But if you plan on reading the original series, Sinner does contain spoilers that are unavoidable. And there's the whole Wolf thing you have in common too. I really want to read The Raven Boys, actually bought a copy but it's just been sitting on my bookshelf. She's an incredible storyteller, you'll have to move it up your list. I really need to get started with the series! I have it on my kindle and I have Shiver in audio too! I skimmed your review since I'm not familiar with any characters but your rating is enough for me! I need toget started with this asap! Definitely start with Shiver first Amir. The series is a little slow to start, but after a few chapters you'll really start to invest in Grace and Sam. I loved it. Maggie Stiefvater is just brilliant. I'm going to crack open my copy of The Raven Boys soon too, she's just THAT awesome. It sounds really great, I was all ready to get started but on the bus home from work I realised I left it on my desk, noooo! Ah wells, it sounds like there's some great things waiting for me in the forms of Cole and Isabel and their banter. Great review lovely. Oh no. I think you may be in danger of someone at work seeing how gorgeous the cover is and see Maggie Stiefvater's name on the front and take it home. It's that type of book that calls to people, and I'm sure it's probably yelling, TAKE ME. TAKE ME. Wow! Loved the review. I loved the first series but I was kinda ishy about reading this book, but after reading your review I am going to go get this book ASAP. I can't wait to read this book, I read some great reviews about it and I've already have it but something else always comes up. I'm reading this one now and I'm really loving it! I actually didn't like the Wolves of Mercy Falls series too much now that I think about it. Even so, that makes me even happier that I like Sinner. I'm almost halfway in and I can't wait to find out more. I'm glad you really liked this one overall! Lovely review Kelly!